James Harden did not have a very good game against the Warriors last night, despite finishing with 24 points, 13 assists, and 11 rebounds. Move down the box score a bit, and you’ll see that he was 5-of-20 from the field and 1-of-9 from three-point range. What was to blame for the rough shooting night? Probably his messed-up wrist. The Rockets have eight games left to play and are locked into the third seed in the west. They aren’t going to close the gap on the Spurs before the season ends, and the Jazz aren’t a threat to leapfrog them in the standings. If there was ever a scenario in which a team should rest its all-world superstar in preparation for a deep playoff run, it’s the one the Rockets currently find themselves in. That’s all fine and good, but if Harden’s refusal to sit results in his wrist continuing to bother him in the playoffs, it will be hard not to choke on the irony. 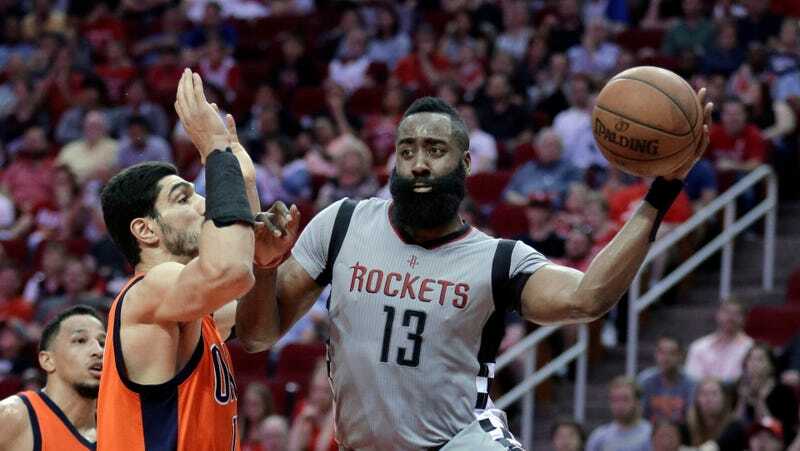 The best way for James Harden to have his teammates’ back is for him to make sure his wrist doesn’t hurt so badly that he shoots them out of the playoffs.